Contents Welcome . . . . . . . . . . . . . . . . . . . . . . . . . . . . . . . . 3 Insights . 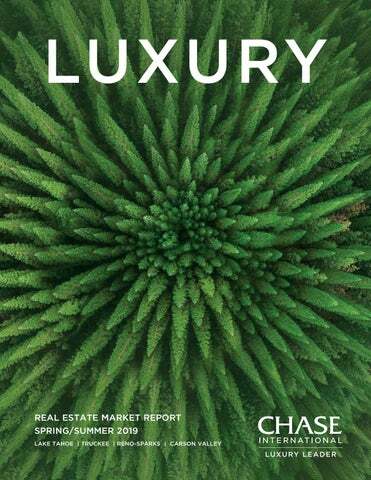 . . . . . . . . . . . . . . . . . . . . . . . . . . . . . .
welcome Chase life—joy, health, success This year we’re thrilled to report that the luxury market has exceeded all expectations. Our vibrant local lifestyle continues to be a top choice for luxury homebuyers from around the world. At Chase International, our experienced Certified Luxury Home Marketing Specialists have an extraordinary ability to bring your dreams to life. We invite you to experience what the Chase Luxe Team can do for you! Lake Tahoe dazzles with new developments. The latest, Clear Creek Tahoe and Zalanta, offer once-in-a-lifetime opportunities to invest. Take a moment to learn more about luxury in the High Sierra. We know you’ll be happy you did. Reno is exploding with more companies moving in to take advantage of Nevada’s inviting tax structure. Truckee is evolving into the trendiest town to reside. Yes, we’re proud of our region, and we’d love to share it with you. Now that 2018 is in the books, it’s time to reflect on our year-end numbers. The Tahoe luxury market experienced a record-breaking year. Leading the way, the West-North Shore witnessed a dollar volume increase of 55%, followed by the East Shore at 35%, Incline Village at 21%, and South Lake Tahoe at 9%. Dollar volume for luxury homes in Truckee increased 17% in 2018, with the median luxury price reaching $1.6 million. Martis Camp, where prices average $5.3 million per sale, saw the highest priced sale of the year at $11,750,000. The top sale in 2018 was a lakefront on the West Shore in Sunnyside that sold for $40 million. The next most expensive sold for $24 million, also in Sunnyside, coincidentally right next door to a $37 million property that closed in early 2019. 15 lakefronts on the East Shore sold this year, with Chase participating in 10 of these high-end transactions. The top-priced lakefront property sold for $13,145,000, with Chase representing both sides. In Incline Village, Chase represented clients in the sale of two exclusive lakefront estates, one for $13.5 million and the other for $10 million. On the South Shore, Chase represented clients in 37 transaction sides involving properties over $1,000,000 for a record year in South Lake Tahoe. Reno-Sparks Reno saw an incredible 57% upswing in luxury dollar volume for 2018. 218 properties over $1 million sold, a 51% increase from the prior year, as median price softened by 1% to $1,287.500. The highest priced home, a property in Montreux, sold for $4.9 million. Information gathered from Incline Village, Tahoe Sierra, Sierra Nevada, NNRMLS and South Lake Tahoe Board of Realtors MLS 01/07/2018. Chase continues to lead the luxury real estate market, selling more homes over $5, $10 and $20 million, year after year after year.Â We are proud to have sold almost $1.4 billion worth of property in 2018, brokering 2,316 transaction sides. With a history of unparalleled success, in 1996 and 1998, when the highest-priced property sold in New York City was $12 million, Chase negotiated record-breaking sales of $50 million and $30 million, unheard of in the nation at that time. We held that record nationwide for eight years. Bolstered by our luxury heritage and strength of character, Chase agents excel at innovation, creativity, negotiation and bringing about a happy and productive result for each client.Â We are grateful to our loyal clientele, our talented colleagues and our dedicated agents for the success we have enjoyed for 33 years. Information gathered from MLS and County records. Transactions since 1989 through 02/14/2019. Clear Creek Tahoe Intimate. Private. Spacious. Our partnerships take your property into every global market. Chase International is connected to 550+ top-tier independent real estate brokerages, from the San Francisco Bay Area to New York City and beyond, spanning 60 countries on six continents around the globe, including our London office. Through this partnership we reach over 120,000 real estate agents, who represent more $1M+ properties than any other real estate company in the world. Together we close over $500 billion in annual sales, with one of our transactions closing every 15 minutes. WHO’S WHO IN LUXURY REAL ESTATE - THE BOARD OF REGENTS Chase is one of the top 520 luxury residential real estate firms around the world that meet annually to discuss the future of the business and network with top agents around the globe. This preferred, exclusive knowledge provides Chase with superior insight and exposure for its clients. Brokers with this distinction provide leadership and the highest level of personal service and commitment to their clientele. LUXURY PORTFOLIO INTERNATIONAL Luxury Portfolio International® is the luxury face of Leading Real Estate Companies of the World® the largest global network of premier locally branded companies dominated by many of the world's most powerful independent luxury brokerages. LEADING REAL ESTATE COMPANIES OF THE WORLD Through this premier International magazine for luxury estates, Chase features its prestigious properties twice a year to target affluent clients. Its circulation includes an exclusive distribution to each member’s private database, and to the world’s premier hotels, international airports and bookstores. MAYFAIR INTERNATIONAL REALTY We have expanded our London office to include United Kingdom’s Mayfair International Realty in response to the increased traffic of overseas buyers. By doing so, we have further provided a marketing platform for our properties to European investors. Mayfair International connects to 125 real estate brokerages with 350 offices, each with a stellar reputation in their respective countries. Mayfair International will showcase all Chase International listings over $250,000 on their website, Mayfairinternationalrealty.com. In addition, Country Life uploads all Chase properties over $1 million to their magazine website, Countrylife.co.uk. Country Life has been a national institution in the U.K. for over 100 years; a copy is hand-delivered to the Royal Family each week. Mayfair provides advertising and public relations opportunities to ensure maximum exposure for Chase International listings. LEADING ESTATES OF THE WORLD Through this premier International magazine for luxury estates, Chase features its prestigious properties twice a year to target affluent clients. Its circulation includes an exclusive distribution to each member’s private database, and to the world’s premier hotels, international airports and bookstores. ARTISAN GROUP The Artisan Group is a strategic alliance of high image real estate companies reaching from the greater San Francisco Bay area to Lake Tahoe. Chase clients benefit from this prestigious group’s network of professional real estate brokers. Through this alliance, Chase is able to provide superior service to qualified audiences in an expanded market area. NEARLY $1.4 BILLION IN ANNUAL SALES. 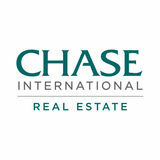 Chase International is one of the nation’s most successful independent real estate firms specializing in unique and distinctive properties in the Tahoe/Reno region. With more than 350 compassionate and determined REALTORS® in 10 offices, we are committed to our client success. We have more qualified luxury professionals and top lakefront specialists with the experience and connections to serve all your needs. We empower people to achieve unlimited possibilities, make magical life decisions, and bring peace and harmony into their lives. This is our secret power. Put the Chase Power of Success to work for you.